It was Felix's job to deliver the invitation. On such a sparkling, sunny morning after weeks of cold rain he was glad to be outside, stretching his legs. Not that he had far to go- Mr and Mrs Shelley's villa was just a short walk through the apple orchard. 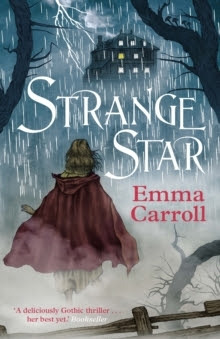 Emma Carroll is one of my favourite authors. Literally everything stops for an Emma Carroll book. Each book is unique and the story never lets me down. I really loved Strange Star. Oozing with Gothic aromas, this story captures your interest and catapults you back to the 1800's. The story is told in third person, from two different view points. The beginning and the end of the book are told by Felix, a young boy, freed from slavery and working for Lord Byron. You feel his excitement and fear at the discovery of a frantic young girl at the door late at night. The middle part of the story is told by Lizzie and what a tale she has to tell. Her fear and bravery are apparent from the very start. Even though this book is historical, it easily portrays diversity as well as strong, career minded females. I loved the female scientist. The book brings back to life well known historical figures, such as Lord Byron and Mary Shelley, capturing a period in their lives and breathing a plausible story into it. Just like all of Emma Carroll's books, this has a real classical feel. I can guarantee that Emma Carroll's books will be the classics for future generations. If you loved Frankenstein, you will love this too.